Well, they’re black, and they’re like bottomless holes. What would you call them? Ah, black holes. The ultimate shiver-inducer of the cosmos, out-jawing sharks, out-ooking spiders, out-scaring… um, something scary. But we’re fascinated by ’em, have no doubt — even if we don’t understand a whole lot about them. But then, that’s why I’m here. Allow me to be your tour guide to infinity. Or the inverse of it, I suppose. Since it’s Halloween this seems appropriate… and my book Death from the Skies! just came out, and there’s lots of ways a black hole can destroy the Earth. Mwuhahahaha. So below I present ten facts about black holes — the third in my series of Ten Things You Don’t Know (the first was on the Milky Way; the second about the Earth). Regular readers will know a few of these since I’ve talked about them before, but I’m hoping you don’t know all of these. And if you do, then feel free to leave a comment preening about your superior intellect. Mind you, this list is nowhere near complete: I could have picked probably 50 things that are weird about black holes. But I like these. 1) It’s not their mass, it’s their size that makes them so strong. The most common way for a black hole to form is in the core of a massive star. The core runs out of fuel, and collapses. This sets off a shockwave, blowing up outer layers of the star, causing a supernova. So the star’s heart collapses while the rest of it explodes outwards (this is the Cliff’s notes version; for more details on the process — which is way cool, so you should read it — check out my description of it). As the core collapses, its gravity increases. At some point, if the core is massive enough (about 3 times the mass of the Sun), the gravity gets so strong that right at the surface of the collapsing core the escape velocity increases to the speed of light. That means that nothing can escape the gravity of this object, not even light. So it’s black. And since nothing can escape, well, read the quotation at the top of the page. OK, so now you know what one is, and how they form. Now, I could explain why they have such strong gravity, but you know what? I’d rather let this guy do it. I hear he’s good. So there you go. Sure, the mass is important, but sometimes it’s the little things that count. 2) They’re not infinitely small. So OK, they’re small, but how small are they? Out here, we’ll never know for sure. We can’t see in, and it sure enough isn’t gonna send any info out. But our math in these situations is pretty good, and we can at least apply them to the collapsing core, even when it’s smaller than the event horizon. It will continue to collapse, and the gravity increases. Smaller, smaller… and when I was a kid I always read that it collapses all the way down to a geometric dot, an object with no dimensions at all. That really bugged me, as you can imagine… as well it should. Because it’s wrong. At some point, the collapsing core will be smaller than an atom, smaller than a nucleus, smaller than an electron. It’ll eventually reach a size called the Planck Length, a unit so small that quantum mechanics rules it with an iron fist. A Planck Length is a kind of quantum size limit: if an object gets smaller than this, we literally cannot know much about it with any certainty. The actual physics is complicated, but pretty much when the collapsing core hits this size, even if we could somehow pierce the event horizon, we couldn’t measure its real size. In fact, the term "real size" doesn’t really mean anything at this kind of scale. If the Universe itself prevents you from measuring it, you might as well say the term has no meaning. And how small is a Planck Length? Teeny tiny: about 10-35 meters. That’s one one-hundred quintillionth the size of a proton. 3) They’re spheres. And they’re definitely not funnel shaped. The gravity you feel from an object depends on two things: the object’s mass, and your distance from that object. This means that anyone at a given distance from a massive object — say, a million kilometers — would feel the same force of gravity from it. That distance defines a sphere around an object: anyone on that sphere’s surface would feel the same gravity from the object at the center. Some people think of black holes as being circles, or worse, funnel-shaped. The funnel thing is a misconception from people trying to explain gravity as a bending in space, and they simplify things by collapsing 3D space into 2D; they say the space is like a bed sheet, and objects with mass bend space the same way that a massive object (a bowling ball, say) will warp a bed sheet. But space is not 2D, it’s 3D (even 4D if you include time) and so this explanation can confuse people about the actual shape of a black hole event horizon. I’ve had kids ask me what happens if you approach a black hole from underneath! They sometimes don’t get that black holes are spheres, and there is no underneath. I blame the funnel story. Sadly, it’s the best analogy I’ve seen, so we’re stuck with it. Use it with care. It’s kind of an odd thought, but black holes can spin. Stars rotate, and when the core collapses the rotation speeds way, way up (the usual analogy is that of an ice skater who brings in his arms, increasing his rotation rate). As the core of the star gets smaller it rotates more rapidly. If it doesn’t quite have enough mass to become a black hole, the matter gets squeezed together to form a neutron star, a ball of neutrons a few kilometers across. We have detected hundreds of these objects, and they tend to spin very rapidly, sometimes hundreds of times a second! The same is true for a black hole. Even as the matter shrinks down smaller than the event horizon and is lost to the outside Universe forever, the matter is still spinning. It’s not entirely clear what this means if you’re trying to calculate what happens to the matter once it’s inside the event horizon. Does centrifugal force keep it from collapsing all the way down to the Planck length? The math is fiendish, but do-able, and implies that matter falling in will hit matter inside the event horizon trying to fall further but unable to due to rotation, This causes a massive pile up and some pretty spectacular fireworks… that we’ll never see, because its on the other side of infinity. Bummer. The spin of the black hole throws a monkey in the wrench of the event horizon. Black holes distort the fabric of space itself, and if they spin that distortion itself gets distorted. Space can get wrapped around a black hole — kind of like the fabric of a sheet getting caught up in a rotating drill bit. This creates a region of space outside the event horizon called the ergosphere. It’s an oblate spheroid, a flattened ball shape, and if you’re outside the event horizon but inside the ergosphere, you’ll find you can’t sit still. Literally. Space is being dragged past you, and carries you along with it. You can easily move in the direction of the rotation of the black hole, but if you try to hover, you can’t. In fact, inside the ergosphere space is moving faster than light! Matter cannot move that fast, but it turns out, according to Einstein, space itself can. So if you want to hover over a black hole, you’d have to move faster than light in the direction opposite the spin. You can’t do that, so you have to move with the spin, fly away, or fall in. Those are your choices. Gravity depends on distance. The farther you are from an object, the weaker its gravity. So if you have a long object near a massive one, the long object will feel a stronger gravitational force on the near end versus a weaker force on the far end! This change in gravity over distance is called the tidal force (which is a bit of a misnomer, it’s not really a force, it’s a differential force, and yes, it’s related to why we have ocean tides on Earth from the Moon). The thing is, black holes can be small — a BH with a mass of about three times the Sun has an event horizon just a few kilometers across — and that means you can get close to them. And that in turn means that the tidal force you feel from one can get distressingly big. Praying to this guy won’t help. Let’s say you fall feet first into a stellar-mass BH. It turns out that as you approach, the difference in gravity between your head and your feet can get huge. HUGE. The force can be so strong that your feet get yanked away from your head with hundreds of millions of times the force of Earth’s gravity. You’d be stretched into a long, thin strand and then shredded. So getting near a black hole is dangerous even if you don’t fall in. Evidently, there really is a tide in the affairs of men. Matter falling into a black hole would rarely if ever just fall straight in and disappear. If it has a little bit of sideways motion it’ll go around the black hole. As more matter falls in, all this junk can pile up around the hole. Because of the way rotating objects behave, this matter will create a disk of material whirling madly around the hole, and because the gravity of the hole changes so rapidly with distance, matter close in will be orbiting much faster than stuff farther out. This matter literally rubs together, generating heat through friction. This stuff can get really hot, like millions of degrees hot. Matter that hot glows with intense brightness… which means that near the black hole, this matter can be seriously luminous. And as if black holes aren’t dangerous enough, the matter gets so hot right before it makes the final plunge that it can furiously emit X-rays, high-energy forms of light (and the beams can emit even higher energy light than that). So even if you park your spaceship well outside the event horizon of a black hole, if something else falls in and gets shredded, you get rewarded by being fried by the equivalent of a gazillion dental exams. 8) Black holes aren’t always dangerous. I’m right there with you, dude. Most people think the Earth would fall in, sucked inexorably down by the black hole’s powerful gravity. But remember, the gravity you feel from an object depends on the mass of the object and your distance from it. I said the black hole has the same mass as the Sun, remember? And the Earth’s distance hasn’t changed. So the gravity we’d feel from here, 150 million kilometers away, would be exactly the same! So the Earth would orbit the solar black hole just as nicely as it orbits the Sun now. Of course, we’d freeze to death. You can’t have everything. However, remember that as matter falls in it can get hot. It can be so hot that the pressure from light itself can blow off material that’s farther out, a bit like the solar wind but on a much grander scale. The strength of the wind depends on many things, including the mass of the black hole; the heftier the hole, the windier the, uh, wind. This wind prevents more matter from falling in, so it acts like a cutoff valve for the ever-increasingly girthy hole. In fact, when we look into the Universe today, we see that pretty much every large galaxy has a supermassive black hole in its heart. Even the Milky Way has a black hole at its core with a mass of four millions times that of the Sun. Before you start running around in circles and screaming, remember this: 1) it’s a long way off, 26,000 light years (260 quadrillion kilometers), 2) its mass is still very small compared to the 200 billion solar masses of our galaxy, and therefore 3) it can’t really harm us. Unless it starts actively feeding. Which it isn’t. But it might start sometime, if something falls into it. Though we don’t know of anything that can fall into it soon. But we might miss cold gas. 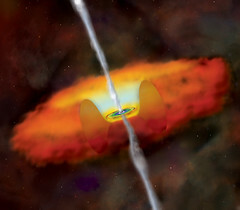 As you might expect, the event horizon of a black hole gets bigger as the mass gets bigger. That’s because if you add mass, the gravity gets stronger, which means the event horizon will grow. If you do the math carefully, you find that the event horizon grows linearly with the mass. In other words, if you double the black hole’s mass, the event horizon radius doubles as well. No! You’ve doubled the mass, but the radius only increases a little bit. Because volume goes as radius cubed, to double the radius of your final clay ball, you’d need to lump together eight of them. So now let’s look at the average density of matter inside the event horizon of the black hole. If I take two identical black holes and collide them, the event horizon size doubles, and the mass doubles too. But volume has gone up by eight times! So the density actually decreases, and is 1/4 what I started with (twice the mass and eight times the volume gives you 1/4 the density). Keep doing that, and the density decreases. A regular black hole — that is, one with three times the Sun’s mass — with have an event horizon radius of about 9 km. That means it has a huge density, about two quadrillion grams per cubic cm (2 x 1015). But double the mass, and the density drops by a factor of four. Put in 10 times the mass and the density drops by a factor of 100. A billion solar mass black hole (big, but we see them this big in galaxy centers) would drop that density by a factor of 1 x 1018. That would give it a density of roughly 1/1000 of a gram per cc… and that’s the density of air! A billion solar mass black hole would have an event horizon 3 billion km in radius — roughly the distance of Neptune to the Sun. See where I’m going here? If you were to rope off the solar system out past Neptune, enclose it in a giant sphere, and fill it with air, it would be a black hole! That, to me, is by far the oddest thing about black holes. Sure, they warp space, distort time, play with our sense of what’s real and isn’t… but when they touch on the everyday and screw with that, well, that’s what gets me. You can find answers to these and other questions elsewhere on the web (and even on this very blog); I couldn’t cover everything in just ten sections! But I’ll note (shocker) that chapter 5 of my book Death from the Skies! talks in detail about how they form, and what they can do if you get too close to them. Later chapters also talk about the black hole in the core of the Milky Way, and what will happen to black holes a long time from now… literally, 1060, 1070, even a googol years from now. "If there’s any justice at all, the black hole will be your grave!"